Color lithograph printed on Arches paper. Timmie by Alex Katz. Original etching and aquatint on paper. Brooke Alexander, Inc., New York & Marlborough Graphics Inc., New York. Hand signed by the artist. June Enkman's Class. 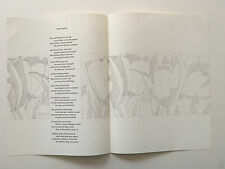 Original linocut on wove paper by Alex Katz along with a poem by his son, Vincent Katz, from A Tremor in the Morning, 1986. Signed on the justification sheet by Alex Katz and Vincent Katz. A photocopy of this will be included with the print. Small Head (Second State), 1972. Edition of 20, Artist Proof. The suite was co published by Katz and Marlborough Graphics, Inc. (NYC) in 1993, and printed by John C. Erickson (NYC). This woodblock print is printed on Hoshi mulberry paper, in an edition of 30 copies with 9 Artist Proofs. Alex, 1970. Color lithography - printed by Mourlot. Original etching and aquatint on paper. Harmony by Alex Katz. Brooke Alexander, Inc., New York & Marlborough Graphics Inc., New York. June Enkman's Class. Rather than observing a scene from afar, the viewer feels enveloped by nearby nature. Katz began each of these canvases with “an idea of the landscape, a conception,” trying to find the image in nature afterwards. SCREENPRINT ON PAPER. "THE EMPEROR JONES". YEAR: 2006. SIGNATURE: HAND SIGNED & NUMBERED BY THE ARTIST. EDITION: OF 60. ARTWORK IS IN EXCELLENT CONDITION. Original etching and aquatint on paper. Judy by Alex Katz. Brooke Alexander, Inc., New York & Marlborough Graphics Inc., New York. June Enkman's Class. Good Luck! Edition Size: Limited. Here's another work from the incredible Alex Katz ! This is titled Jessica. Created in 1994 in an edition of 200 plus proofs. The paper size is approx. 13 1/2" x 12 1/4" and the image size is approx. Here's another work from the incredible Alex Katz ! This is titled Jessica. Created in 1994 in an edition of 200 plus proofs. This edition is 23/200. The paper size is approx. 13 1/2" x 12 1/4" and the image size is approx. SILKSCREEN & LITHOGRAPH ON ARCHES COVER WHITE PAPER. YEAR: 1979. SIGNATURE: HAND SIGNED & NUMBERED BY THE ARTIST. Jane Awakens--an original photo lithograph by Alex Katz. Signed in the plate. Published by Museum of Modern Art in 1967. On Mohawk Superfine Paper in an edition of 2500. Excellent condition. Many other great artists participated in this publication--a total of 30 poems in all. SCREENPRINT IN COLOURS ON ARCHES RAG PAPER. FROM 'ALEX AND ADA' PORTFOLIO. "GREY RIBBON". YEAR: 1990. SIGNATURE: HAND SIGNED & NUMBERED BY THE ARTIST. ARTWORK IS IN EXCELLENT CONDITION. "MAC, RON & NABIL". SIGNATURE: EACH HAND SIGNED & NUMBERED BY THE ARTIST. ARTWORK IS IN EXCELLENT CONDITION. CERTIFICATE OF AUTHENTICITY INCLUDED. Sasha 2 by Alex Katz. Hand signed by the artist. We will also attempt to locate almost any print for you at or near dealer prices. We represent among other artists: Richard Serra ,Alex Katz, Robert Motherwell, Robert Mangold, Donald Sultan, Donald Judd, Robert Longo, David Shapiro, Caio Fonseca, Sean Scully, Julian Opie, Pierre Soulages, Sonia Delauney and Bernar Venet. SCREENPRINT ON ARCHES PAPER. YEAR: 1976. SIGNATURE: HAND SIGNED & NUMBERED BY THE ARTIST. EDITION: OF 200. ARTWORK IS IN EXCELLENT CONDITION. Original woodcut, handsigned and numbered. 90403 Nuernberg/Germany. GALERIE FRANK FLUEGEL. Size / Grösse. JANE AWAKENS - An original photo lithograph by Alex Katz. Signed in the plate. Published by the Museum Of Modern Art in 1967. With a sheet size of 18 x 22. On Mohawk Superfine Paper in an edition of 2500 and in excellent condition - there are the usual folio folds in the middle. The Emperor Jones by Alex Katz. Original silkscreen on paper. Excellent MINT PERFECT CONDITION.